Enjoy a narrated transfer to the spectacular icewall of the Mendenhall Glacier and its adjacent Visitors Center. Roam the grounds, snap photos, take in the interactive exhibits, and turn to a ranger who can satisfy your curiosity about the natural wonders of the Mendenhall. From Mendenhall Glacier you’ll be transported to Auke Bay. There your captain and onboard naturalist will welcome you aboard our state of the art 48-passenger jet boat custom designed for Juneau whale watching with large windows, an outside viewing deck and an amplified hydrophone system for listening to whales communicate under water. Juneau has a healthy humpback whale population with some 65 whales returning each season to feed in the nutrient-rich waters and your captain is well versed in locating them. In fact, whale sightings are guaranteed! 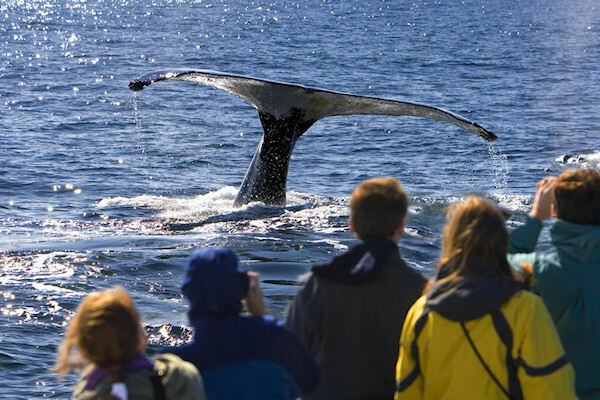 If a whale is not spotted during your cruise we’ll refund you 0! Your captain will let you know when whales are spotted, but it’s more likely you’ll first be alerted by the collective chorus of “Oohhs!” and “Awwhhs!” from your fellow adventurers as they witness a giant humpback suddenly breach. Binoculars are available for your use onboard. Venture out on the deck to enjoy a panoramic view of your surroundings or to take a photo. Or, settle into your warm and comfortable interior surroundings to enjoy the scenery and wildlife sightings through the oversized windows. Following your cruise you’re off to the Gold Creek Salmon Bake. In a beautiful setting nestled in the rain forest, you’ll arrive to the aroma of wild Alaskan salmon grilling over an open alder wood fire. The all-you-can-eat buffet also includes Cheechako Chicken, Gold Rush Potatoes, Chilkoot Baked Beans, Tongass Wild-Rice Pilaf, salads and other sides, beverages and blueberry cake for dessert! After your meal, roast marshmallows over a crackling campfire, visit the Salmon Creek Trading Post and stroll to the beautiful Salmon Creek waterfall. Take your time! With frequent courtesy bus service, you can return at your leisure. Dress comfortably and bring your camera. Child rate applies to children 12 and under. Children 12 and under must be accompanied by an adult. Children ages 13-17 must have a signed parental consent form to participate in the absence of a parent or guardian. PLEASE NOTE: Please ask for the return times for the shuttle buses to ensure that you will be back at the pier before departure time. Some final notes: bring your vouchers and dress comfortably for the weather (if your tour is on the water it will be about 10 degrees cooler.) Camera and binoculars are suggested for land-based tours. However, while on tours involving rafts, canoes and kayaks, we suggest you bring disposable cameras. This tour is not suitable for wheelchair and/or scooter guests due to the uneven terrain at the salmon bake.